Could help. This xkcd cartoon demonstrates the general categories of existence, and I think could help us decide what our topic and scale are. This works all right, but I think this list might work better for our purposes. Mathematics is used in each of the studies. I'm a bit confused on what you meant when talking about the 10,000-20,000 thing Hex, care to explain that again? Taken at different heights during snowfall. I have a hypothesis about a second force called evasitism, the name based on the Latin verb evadere, that acts on a few properties of objects that are independent from its pondity. The force is what pushes objects away from each other, and manifests in players and items being pushed out of blocks, mobs pushing each other, and mobs not being able to go through blocks by simple movement. It seems to work independently from ponditism, but the Y axis is treated strangely, as mobs don't push other mobs vertically, and items are only moved upwards on the Y axis when inside a block, and players aren't moved at all. I wrote some more stuff about evasitism, but I want to know if this is a viable force. Nothing that humanity has done has been impossible. I'm really disappointed in you humanity. Could you explain what you mean about being pushed out of blocks? If you glitch into a block you _don't_ , in my experience, get pushed out, if it's a transparent block you can stay there all day if you want, if it's a solid block you take suffocation damage. Dropped items can be pushed out of a hole by placing a block but otherwise I'm not sure what you mean? As for mobs, and presumably players, pushing mobs, I don't understand why that requires a special force? Can they/we just push? Hm... what explains how you can build on top of the Nether but not beneath it? Or how you can build all over the End despite its weirdness? The "Top" of the Nether is actually only halfway up. the upper half of that isn't empty, it's air, and the same applies to the "empty" parts of the End. I actually don't see any inherent issues with the hypothesis, even if it needs to be refined a little. You do get pushed out of solid blocks when you are stuck, but you can't enter other blocks. For instance if a 1 block wide pillar of sand falls on you, you take a bit of damage and are pushed to the side. Transparent blocks on the other hand, not sure. Mobs do push each other around (and the player in 1.9), and items can be pushed around as well, however when talking about the y axis, they can only be "pushed" up, not down. That almost leads me to believe something else is going on with items not necessarily related to this. The reason they can't "just push"... well its a bit like real life. If the electromagnetic force didn't exist, then "touching" things wouldn't even be a concept, let alone pushing them around or not falling through the ground for that matter. If I may add some thoughts, could evasitism also explain why we don't fall through blocks and possibly explain things that cause acceleration like powered rails? I believe that bedrock is actually solidified void energy. 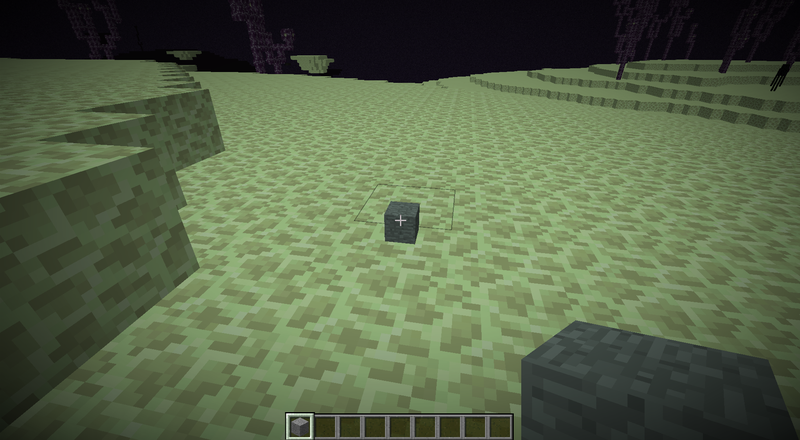 It seems that bedrock is immune to the effects of void energy (or at least more resilient than anything else). Usually, the same thing does not destroy itself, like fire (fire does not destroy fire). So if bedrock and void energy is the same than that explains why bedrock is so strong. Another similarity: Both are super strong just in different ways. While the void destroys everything bedrock protects itself from everything. 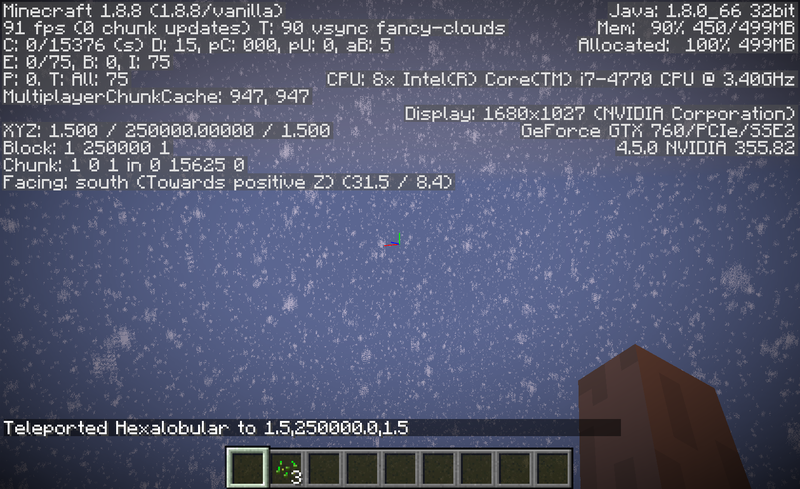 I estimate that it takes about 1000000 years for void energy to condense into a full block of bedrock. Interesting. That would explain bedrocks seeming invincibility. However, why the time of 1000000? That seems to just be thrown in there just because. Also, I feel like we need to focus on the void a bit more. I don't love the relation explanation of it, I feel like its a bit vague. Any thoughts? That is an excellent question. The upper voids all seem to act differently than the lower ones (lower ones cause damage, have particles, and are dark). 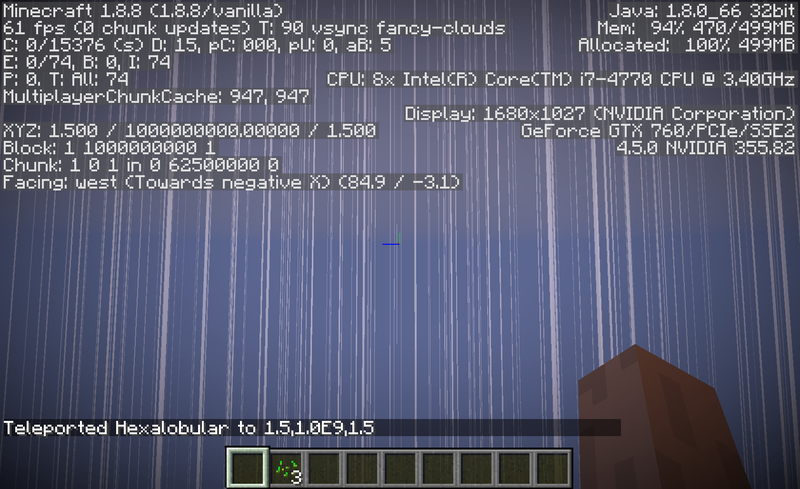 The nether is especially weird though, since above the nether technically isn't a "void". I actually don't see any inherent issues with the hypothesis, even if it needs to be refined a little. You do get pushed out of solid blocks when you are stuck, but you can't enter other blocks. For instance if a 1 block wide pillar of sand falls on you, you take a bit of damage and are pushed to the side. Transparent blocks on the other hand, not sure. I'm not at all sure that you are ever inside the falling sand? Don't you get pushed aside by being hit by it just like being hit by a solid object in RL? Unlike IRL, MC sand and gravel are solid, at least when placed, falling sand/gravel is a bit odd, being able to pass through a torch, for instance, but dropping as an item if landing on the torch. I think that's the same kind of thing as a placed block pushing aside dropped items. As I'm seeing it, evasitism/emf seems to be a oneway force in Minecraftia, either only existing on the outer surface of a block/mob or at least canceling out on the inside, it affects you if you try to enter a block or mob from the outside but if you somehow get inside it doesn't affect you, you are free to stay in place or exit, once you exit it hinders you from going back in. Even while exiting I don't recall it pushing you out, I wonder if you can't go halfway out and just stop there? Maybe even go back inside as long as you hadn't exited into the neighbouring block? I'm going to have to disagree with you there. It still pushes you when your inside the block. Build a machine similar to the one I have built in the attachment (both pistons are sticky), then stand on the blue wool and pull the lever. The piston on the left will activate instantly, pushing a block into your head (or your feet if you place the wool one block higher, it works either way), but you are blocked in on all four sides meaning you aren't pushed out of position. 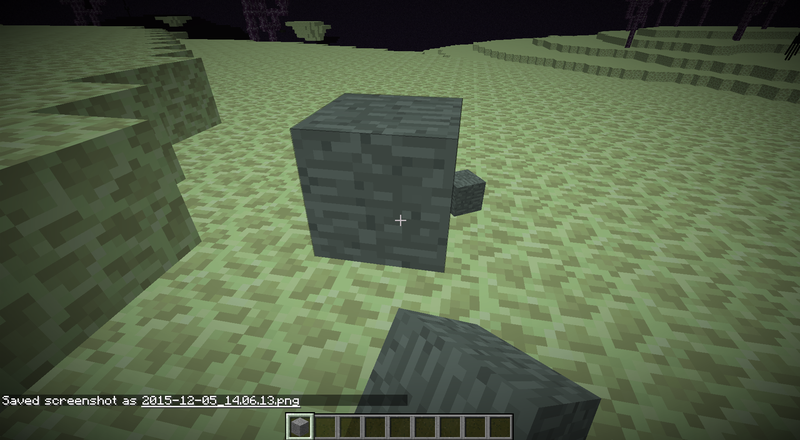 Then, a couple seconds later the right piston activates, allowing the stone in your head to push you out of the way. If it worked like you supposed, then when the second piston activates, you wouldn't be pushed out of the way because the block is already in your head. Added a section on blockule hypothesis to OP. In real life, the force that keeps things apart is called "Normal Force." However, in Minecraft it seems to be more of a suggestion of solidity in many cases. Kinda like what jello does, if you push on something, it will give but gradually push out. I'd almost say it has something to do with Pondity, given that solid blocks push hard, gravity-based blocks push hard only sometimes, and mobs and items have less 'push' to them. I also thought so too, but I noticed that items, which have a medium pondity, don't have any eviction at all, but mobs, which have a higher pondity. Solid blocks have a very low pondity, but have an eviction so great you don't even enter, but small plants and decoration, which have a medium pondity, also have no eviction. Evasity: How strong the eviction is. Evasitism resistance: How much an object will stay in place when evicted. There also seems to be a Y factor included that involves the evictor's pondity. The evidence for that is that blocks evict items upwards, but mobs don't evict other mobs on the Y axis at all. And also, I decided, when something pushes on something else with evasitism, it's called eviction. Why is there a Y factor? Why does sand's evasity reduce when falling (applies to gravel as well)? Very interesting, I wonder if I misremember or if things have changed? Something must have changed since I believe this used to be a way of getting X-ray vision? An added observation, if your exit is blocked by a transparent block then you are pushed up against that block, if there are two transparant blocks on adjacent sides you are pushed into that corner, I haven't determined what decides which way you are pushed if the transparent blocks are on opposite sides. 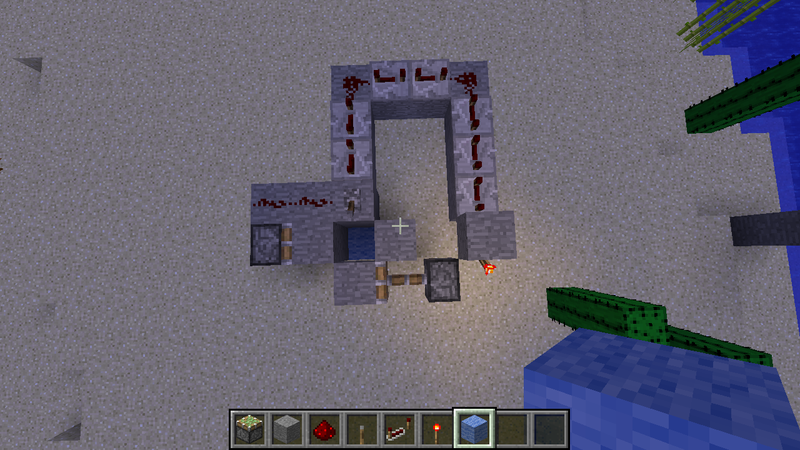 Adding non transparent blocks on the sides with the transparent blocks restores your free movement inside your block. Though I note that with your head in a block, even though it appears you can see the inside of the block the view doesn't change when you move. There is still some form of cancelation of forces if your exit is blocked by non transparent blocks. Also no attempt is made to push your legs out of the block if your head is blocked in or vice versa. Further observations, if you are pressed into a transparent block you are not ejected, that's probably the source of my confusion. Also, as you may have indicated, one isn't ejected upwards though one can exit a block by jumping if it's at leg level. Nor is one ejected downwards, though one would fall out if unsupported and not flying. I actually think evasitism doesn't work vertically at all, it is only a horizontal force for some reason. I think items move upward in blocks because of something totally different. I think the direction you are pushed is determined by where you are in the block. If I'm right, you get pushed directly away from the center. The question of transparent blocks is very puzzling. Isn't evasitism responsable for keeping you from entering a block, under normal circumstances, as well as ejecting you from a block you have managed to enter? I'm still unclear about items moving in blocks, I was (partially) wrong about players being ejected from blocks but I'm still not convinced that items can exist inside blocks, can you give an example? Transparent blocks are weird in this model. They evict objects outside, but not inside. Because mobs also exhibit this property, but nothing else has this property, I decided to add a fourth property: Evasitism eye radius (based on the eye of a storm). Evasitism doesn't evict objects inside the eye. If you place a block where an item is, rather than refusing to place, it will place, and the item is inside the block. I still can't think of an example of that, what kind of items are you talking about? Nope, nowhere near that simple. With transparent blocks in all directions I find I am forced E and either N or S depending on which is closest. With a nontransparent block to the E I am forced SW.
With nontransparent blocks E and W I'm forced S and free to move E/W. With nontransparent blocks N and S I'm forced E and free to move N/S. With a nontransparent block S I'm forced NE, but if I'm at the extreme S edge I'm forced E but can stay S as long as I don't move N, the slightest movement to the N forces me N.
With a nontransparent block W I'm forced NE, an oddity is that if I start in the middle of the W edge I'm moved first S then E then N.